Africa today seems like one, giant nightmare. The enormous continent, which easily dwarfs the United States, is currently in the grips of several regional conflicts. There is the Somali Civil War, the war against Boko Haram in Nigeria, the War in Darfur, the Libyan Civil War, the South Sudanese Civil War, and the Central African Republic Civil War just to name a few. Away from the battlefield, severe income inequality, high rates of HIV infection and other diseases, and astronomically high crime rates rack nominally peaceful African countries. South Africa, which was once considered the most Western state in Africa south of the Sahara, experienced approximately 51.2 murders a day in 2016. Believe it not, Fred Bridgland, author of The War for Africa, asserts that, for a brief moment, Africa transformed for the better. The impetus driving this change as the 1987–1988 war in Angola. Just a decade prior, the Carnation Revolution in Portugal overthrew the Estado Novo government of Antonio de Oliveira Salazar and brought the long Portuguese war to maintain imperial control over Angola to an end. But the peace would prove short-lived, as two major guerrilla factions—the People’s Movement for the Liberation of Angola (MPLA) and the National Union for the Total Independence of Angola (UNITA)—began fighting to control the government in Luanda. The MPLA received substantial funding and military training from the Soviet Union, which, under the leadership of Leonid Brezhnev, reaffirmed Moscow’s belief in Marxist-Leninist revolution by trying to export communism to the so-called Third World. Another major contributor to the MPLA’s cause was the regime of Fidel Castro, which sent armor, troops, and planes to Angola. On the other side, the guerrillas of UNITA, led by the charismatic and brilliant strategist Jonas Savimbi, managed to hold out against MPLA thanks to CIA support. Yet when this support dried up in the 1970s, UNITA’s main backer became the apartheid government of South Africa. The War for Africa provides an in-depth look at how these forces vied for control of a small corner of southeastern Angola. Told primarily from the perspective of South African field officers and “troopies,” Bridgland’s history is almost a blow-by-blow chronicle of the conflict. From the successful South African taking of the Lomba River to the three failed attempts to dislodge MPLA and Cuban troops from Cuito Cuanavale, The War for Africa is an on-the-ground history of how this small war (South African forces only numbered at 3,000 during the war’s apex) turned into a stalemate that created a new peace. When “war-war” became “jaw-jaw,” the officials from Havana, Moscow, Luanda, Pretoria, and Washington, D.C., hashed out a plan wherein all sides could come away from the negotiating table claiming victory. Unfortunately, in the Epilogue, Bridgland has to subtly admit that a majority of the actors in this drama either vanished or descended into political irrelevancy after 1988. For the average reader, Bridgland’s book may be exhausting. A trained journalist who interviewed many of South Africa and Cuba’s top military leaders, Bridgland is very exact about the details. Almost all of his chapters are full of military jargon, discussions about the minutiae of Soviet and South African weaponry, and point-by-point examinations of how certain battles unfolded. If the reader can transcend these hurdles, then they will be richly rewarded by a gripping text that highlights just how much political and social considerations dictate the outcome of war. Also, for Americans unfamiliar with Africa’s many armed struggles during the Cold War, The War for Africa can serve as a good resource for understanding how supposedly “rogue” states like South Africa served the global cause of anti-communism, while Moscow and Havana tried and mostly failed to export their revolutions abroad to Angola, Ethiopia, Rhodesia (now Zimbabwe), and elsewhere. 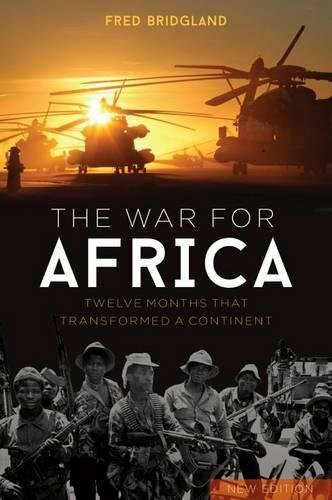 A highly detailed work of military history, The War for Africa can tell us a lot about the nature of counter-insurgency warfare and how small states can become contested battlegrounds between superpowers.